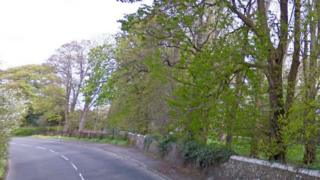 Two people have died and three people have been injured after a car crashed into a tree in South Ayrshire. Police said the white Toyota Corolla had left the road as it approached a bend on the B7024 in Ayr at about 14:30 on Friday. The driver, 30-year-old Ian Clark, and a rear seat passenger, 22-year-old Shannan Rafferty died at the scene. They were both from Girvan. Three other male passengers - two aged 16 and one aged 34 - were injured. One of the teenagers was taken by air ambulance to the Queen Elizabeth University Hospital in Glasgow. His condition is described as serious but stable. The second teenager sustained serious injuries and was taken to Crosshouse Hospital where he remains in a stable condition. The 34-year-old - the front seat passenger - is also in a stable condition and is being treated at Ayr Hospital. Police said the car had come to rest in a field after hitting the tree. Sgt Nicola Taylor said: "I would ask that anyone who was driving either on High Maybole Road, or in the immediate vicinity, who might have seen the car prior to the crash to contact police." The road was closed for eight hours after the incident to allow a crash investigation to take place.